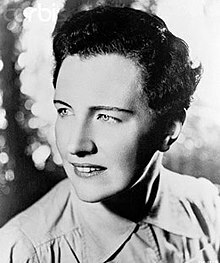 Mary Renault (/ˈrɛnoʊlt/; 4 September 1905 – 13 December 1983), born Eileen Mary Challans, was an English and South African writer best known for her historical novels set in ancient Greece. In addition to vivid fictional portrayals of Theseus, Socrates, Plato, and Alexander the Great, she wrote a non-fiction biography of Alexander. Born at Dacre Lodge, 49 Plashet Road, Forest Gate, Essex (now in London), of physician Frank Challans and Mary Clementine Newsome Baxter Challans, Renault was educated first at Levick family school and Clifton Girls School in Bristol. She read English at St Hugh's College, Oxford, then an all-women's college, receiving an undergraduate degree in 1928. In 1933 she began training as a nurse at the Radcliffe Infirmary in Oxford. During her training she met Julie Mullard (1912 – 1996), a fellow nurse with whom she established a lifelong romantic relationship. She worked as a nurse while beginning a writing career, treating Dunkirk evacuees at the Winford Emergency Hospital in Bristol, and working in Radcliffe Infirmary's brain surgery ward until 1945. She published her first novel, Purposes of Love, in 1939: it has a contemporary setting, like her other early novels, and the novelist Linda Proud has described it as "a strange combination of Platonism and hospital romance". Her novel The Friendly Young Ladies (1943), which is about a lesbian relationship between a writer and a nurse, seems to have been inspired by her own relationship with Mullard. In 1948, after her novel Return to Night won an MGM prize worth $150,000, Renault and Mullard emigrated to South Africa, where they remained for the rest of their lives. There, according to Proud, they found a community of gay expatriates who had "escaped the repressive attitudes towards homosexuality in Britain for the comparatively liberal atmosphere of Durban.... Mary and Julie found themselves able to set up home together in this new land without causing the outrage they had sometimes provoked at home." However, both Renault and Mullard were critical of the less liberal aspects of their new home, and participated in the Black Sash movement against apartheid in the 1950s. Shortly before her death, Mary was listed as one of the famous alumnae who had brought the Radcliffe Infirmary Nurses' Home much honour. Due to the especially wet winter of 1983 in Cape Town, Mary picked up a small cough. At first, the cough was no more than a mild irritant for Mary, but it soon "become a persistent, hacking attempt to clear her lungs and catch her breath." After Julie voiced her fears to their mutual friend Dr. Sonnenberg, x-rays were performed, and Mary was diagnosed with pneumonia and was directed to a nursing home. After failing to eliminate the pneumonia with antibiotics, a visiting British surgeon performed a bronchoscopy under general anaesthetic. Shortly after, the doctor revealed to Julie that he had "found fluid on the lung and had aspirated some it: the cause was cancer." Julie begged the doctors to say nothing to Mary unless she demanded to be told. By October, a friend of Dr. Sonnenberg, Dr. Slome, was draining off liquid twice a week and was convinced that there was a pocket he could not reach. Mary was then put on oxygen in order to ease her breathing. On 12 December 1983, as a last hope, the doctors decided to inject a new chemical into the pleura early the next morning, in the hope that it would stop further fluid from forming. Before the operation even began, Julie received a phone call, which she knew "could only mean one thing". Mary Renault died in Cape Town on 13 December 1983. Although not a classicist by training, Renault was admired in her day for her scrupulous recreations of the ancient Greek world. Some of the history presented in her fiction and in her non-fiction work, The Nature of Alexander has been called into question, however. Her novels about Theseus rely on the controversial theories of Robert Graves, and her portrait of Alexander has been criticized as uncritical and romanticized. According to Kevin Kopelson, professor of English at the University of Iowa, Renault "mischaracterize[s] pederastic relationships as heroic." Defying centuries of admiration for Demosthenes as a great orator, Renault portrayed him as a cruel, corrupt and cowardly demagogue. Renault defended her interpretation of the available sources in author's notes attached to her books. Though Renault appreciated her gay following, she was uncomfortable with the "gay pride" movement that emerged in the 1970s after the Stonewall riots. Like Laurie Odell, the protagonist of The Charioteer, she was suspicious of identifying oneself primarily by one's sexual orientation. Late in her life she expressed hostility to the gay rights movement, troubling some of her fans. David Sweetman remarks in his biography of Renault that her novels generally portray mothers in a poor light and that, particularly in her later novels, this is extended to women in general. Her generally negative depiction of women has also been noted by the critic Carolyn Heilbrun. The powerful impact Renault's work may have had on many readers, especially emerging young gay men, is suggested in a personal memoir by author and critic Daniel Mendelsohn. The King Must Die and its sequel The Bull From the Sea were adapted by Michael Bakewell into a single 11-part BBC Radio 4 serial entitled The King Must Die. It was directed by David Spenser, broadcast between 5 June 1983 and 14 August 1983 and starred Gary Bond (Theseus), John Westbrook (Pittheus), Frances Jeater (queen of Eleusis), Carole Boyd (Aithra), Alex Jennings (Amyntor), Sarah Badel, David March and Christopher Guard. It was repeated on BBC7 17 June 2003. The Charioteer was adapted for BBC Radio 4's Book At Bedtime across ten episodes, broadcast over two weeks from 25 November 2013. ^ a b "Discover - St Hugh's College, Oxford". ^ "She always pronounced it 'Ren-olt', though almost everyone would come to speak of her as if she were a French car." Sweetman, David (1994). Mary Renault: A Biography. Orlando, FL: Harvest/HBJ. p. 74. ISBN 0-15-600060-1. ^ "Renault, Mary (1905–1983) - Encyclopedia.com". www.encyclopedia.com. ^ a b Proud, Linda (1999). "The Glimpse of a Strong Greek Light". Historical Novel Society. Archived from the original on 27 September 2007. Retrieved 23 October 2007. ^ Sweetman, David (1993). Mary Renault. United States: Harcourt Brace & Company. p. 307. ^ Sweetman, David (1993). Mary Renault. United States: Harcourt Brace & Company. pp. 301–304. ^ Slide, Anthony (2003), Lost Gay Novels: A Reference Guide to Fifty Works from the First Half of the Twentieth Century, Routledge, pp. 1–2 . ^ Reames, Jeanne. "Beyond Renault: Alexander the Great in Fiction". Archived from the original on 12 October 2007. Retrieved 23 October 2007. ^ Kopelson, Kevin (1994). "Introduction". Love's Litany: The Writing of Modern Homoerotics. Stanford University Press. ^ Moore, Lisa Lynne (2003). "Lesbian Migrations: Mary Renault's South Africa". GLQ: A Journal of Lesbian and Gay Studies. 10 (1): 23–46. ^ Sweetman 1993, p. 166. ^ Mendelsohn, Daniel. "Personal History The American Boy". Condé Nast. Retrieved 30 January 2013. ^ "The Charioteer" (Abridged by Eileen Horne; read by Anton Lesser; not currently available), bbc.co.uk. Sweetman, David (1993), Mary Renault: a biography, London: Chatto & Windus, ISBN 0-7011-3568-9 . Zilboorg, Caroline (2001), The masks of Mary Renault: a literary biography, Columbia: University of Missouri Press, ISBN 0-8262-1322-7 . "Thursday Sep. 4, 2014", Writer's Almanac with Garrison Keillor, birthday tribute.